• Enter debarred and suspended participants’ identifying information on the General Services Administration list of excluded persons, now known as the System for Award Management (SAM). Information placed on SAM is the responsibility of the Agency issuing the suspension or debarment action. The ISDC also facilitates lead agency coordination, serves as a forum to discuss current suspension and debarment related issues, and assists in developing unified Federal policy. When requested by OMB, the ISDC serves as a regulatory drafting body for revisions to the government-wide nonprocurement suspension and debarment common rule. 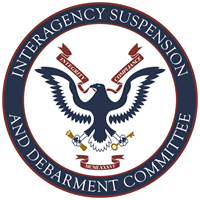 The Interagency Suspension and Debarment Committee (ISDC) serves as a Federal forum to discuss Government-wide non-procurement and procurement suspension and debarment related issues (administered under 2 C.F.R. Part 180 and FAR 48 C.F.R. Subpart 9.4), facilitate lead agency coordination, and assist in developing unified Federal policy. The ISDC, upon Office of Management and Budget (OMB) requests, provides recommendations to the OMB, regarding the Government-wide suspension and debarment remedy. The ISDC’s vision is to promote transparency and best practices across its community to address business and integrity risks within the framework of the Federal suspension and debarment remedy.